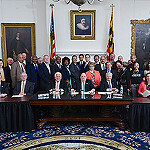 Last week, Governor Hogan signed Maryland’s Justice Reinvestment Act (JRA) into law. Established in 2015 by legislation, the Justice Reinvestment Coordinating Council (The Council) was tasked with analyzing ten years of state corrections and sentencing data to better understand who we have been sending to prison, for how long, and why. Representing a diverse perspective of criminal justice stakeholders that included legislators, judges, prosecutors, defense lawyers, law enforcement, and advocates, the Council crafted solutions for Maryland that would hold offenders accountable while reducing the state’s nonviolent incarcerated population. Simply put, the Council recommendations were based on data, research, evidence-based practices, and serious consideration of public safety. 58 percent of state prison admissions are for nonviolent crimes: possession with intent to distribute and simple drug possession among the top 10 incarcerable offenses. Almost 60 percent of all parole/probation revocations are due to “technical violations” of the conditions of supervision, like missing an appointment or failing a drug test, not a new criminal conviction. 81 percent of inmates serving mandatory minimum sentences for nonviolent drug offenses are black. In FY15, over 30,000 District Court cases filed were for driving while suspended for failure to pay a fine. The recommendations became Senate Bill 1005 and House Bill 1312. Now signed into law, the JRA will save the state close to $200 million over the next decade, and we recommended that those savings be reinvested in drug treatment, community supervision, key reentry services to promote employment, housing, and educational credentialing, and other recidivism-reduction programming. The new law also provides for the creation of the Justice Reinvestment Oversight Board. This board, in collaboration with DPSCS, must determine the annual savings from the implementation of the recommendations of JRA based on the difference between the prison population as measured on October 1, 2017 and the prison population as measured on October 1, 2018 and how those monies are to be spent. Decisions on how and where to reinvest the savings will be guided by the recommendations of local stakeholders. Task Force to examine legal barriers to securing an occupational license for workers with a criminal record. Increased access to expungement for Marylanders convicted of certain nonviolent misdemeanors, such as second degree assault and misdemeanor theft under $1000. Elimination of jail time for driving on a suspended license due to failure to pay a fine, a traffic offense that poses no serious risk to public safety. Increased the dollar amount of stolen items that would trigger felony theft charges. Redefined ‘technical violations’ and requires the Division of Parole and Probation to respond to technical violations using swift, certain, and proportional sanctions to avoid punitive parole/probation revocations in the absence of a new criminal conviction. Eliminated ineffective, racist mandatory minimum sentences for nonviolent commercial drug offenses (drug possession and low level drug dealing). JOTF is all too familiar with the far-reaching consequences of incarceration on low-income families, toiling to eliminate employment barriers for Marylanders struggling with a criminal record. For years, men and women – young and old – have come to Annapolis, often in tears when describing their personal experiences: the jailhouse barber who is prohibited from barbering when released because of his criminal record; or a nephew serving a mandatory minimum sentence for selling drugs to feed his addiction or family. Time and again, we see families struggling to survive when loved ones are locked up. When finally released, they struggle to secure and maintain a stable job with a criminal record. The message is clear: Overreliance on incarceration is not working. So, as the only nonprofit representative of the Justice Reinvestment Coordinating Council (JRCC), I was proud to stand with the Governor and the Maryland General Assembly leadership as they added their signature of approval to this massive overhaul of Maryland’s criminal justice system. Maryland still has work to do to reduce the impacts of incarceration on working families. But, JOTF is thrilled that Maryland’s leaders heeded the call and took this huge leap in the right direction. We look forward to working with state officials and key stakeholders around the state to ensure effective implementation of the Justice Reinvestment Act.